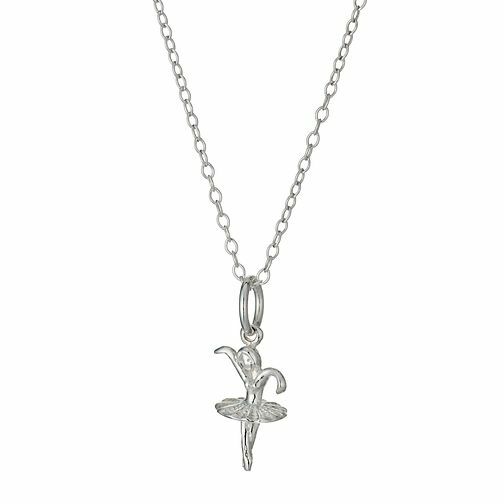 A delicate sterling silver children's chain necklace measuring 14". Set with an engraved sterling silver ballerina pendant, this is an adorable gift perfect for a budding dancer. Children's Sterling Silver Ballerina Pendant is rated 4.0 out of 5 by 3. Rated 2 out of 5 by Anonymous from Indistinguishable Had I not known what this was meant to be I would have great difficulty working out what this pendant was. On arrival I was most disappointed as it looked nothing like the detail in the picture on line which must be expanded to enhance definition. I returned it for a refund. Rated 5 out of 5 by Anonymous from Perfect length for young children The necklace was a Christmas gift for my 2yo ballet mad granddaughter . To be honest for the price I wasn't really expecting much, but when it arrived the necklace was the perfect length for a young child .The chain is robust without looking "chunky " or "tacky" and the little ballerina charm is well made even though the size is specifically designed for little ones. The necklace is perfect for any budding ballet enthusiast . I would highly recommend the necklace as a perfect present.